Roll on round four. It’s ten victories in a row for Bianca Andreescu after she won the much-anticipated rematch of her BNP Paribas Open final clash with Angelique Kerber 6-4, 4-6, 6-1 at the Miami Open. Less than a week after her titanic effort to beat the German in the final at Indian Wells, Andreescu was at it again in Florida. 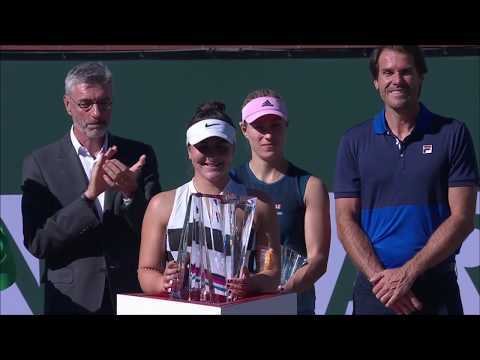 Although there wasn’t a trophy on the line, this edition of the Andreescu-Kerber rivalry was as entertaining as you’d imagine. After being pushed back into the late hours of Saturday night, the match started poorly for Andreescu, who dropped her opening service game to Kerber, whose WTA ranking had risen to fourth earlier in the week. However, the 18-year-old Mississauga-native fought back to claim the first set 6-4. The first set goes to @Bandreescu_! The pair then exchanged breaks early in the second set before Andreescu, now ranked 24th, took what looked to be a decisive lead with a further break in the fourth game. Kerber refused to go away, though, and broke back twice to take what had seemed to be an unlikely advantage just 15 minutes earlier. She would take the second set 6-4. Andreescu would retake the initiative just before the two-hour mark as the 18-year-old broke Kerber early in the third set to establish a 3-1 advantage. Another break to make it 5-1 ensured the Canadian had a tight grip on the decisive set, which she would clinch comfortably in the very next game with a strong service performance. Up next in the round of 16, Andreescu will face 21st-seed Anett Kontaveit of Estonia, who beat Ajla Tomljanović 7-6(3), 2-6, 7-6(4) earlier in the day.